The back of this vintage baseball ornament appears to be floating or suspended on the bursting copper look background. Makes the perfect Baseball Christmas Gifts for players. 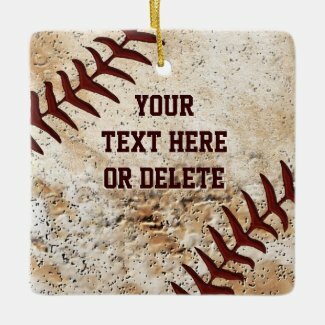 Text box templates are located to your right of the baseball ornaments below the Personalize it section. Just highlight the temporary text and type in your text. 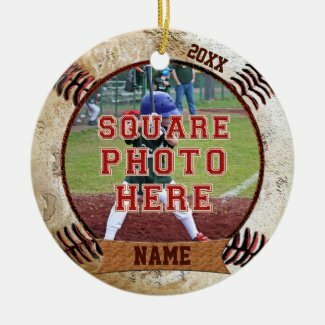 Really cool Personalized Baseball Christmas Ornaments, a great Baseball Team Gift Ideas that they will enjoy all year long, type in his Name, Jersey Number or Monogram, Team Name, Year, etc. Give that special baseball keepsakes a memory that they will cherish for a life time. They will love one of these Personalized Baseball Christmas Ornaments. The perfect Memorable Baseball Christmas Team Gifts for Players and Coaches. Faux Vintage Baseball Designs and Fun Baseball Ornaments for Kids. Be sure to Click “More” when available to see all text box templates. Simply type your text into the template text boxes. which can be found to the right of each baseball ornament under “Edit this design template”. Makes the perfect gift idea for baseball team gifts, players and coaches. 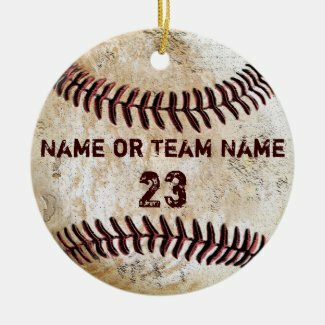 For multiple names and text for Baseball Team Gifts, Personalize ONE baseball ornament at a time, “Add it to Cart” and then go back to customize the next one. OR, type the same text into the text boxes, like the Team Name and Year so you can order the whole team with only personalizing it once. It is quick and very easy to do either way. Create a memory that they can show their own children someday. These Ornaments are made in America by Zazzle. 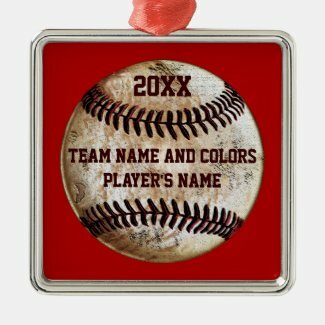 Personalized Baseball Christmas Ornaments, makes the perfect Christmas gift for First Christmas. Many different styles and shapes of Baseball Christmas Ornaments or for any occasion. They will love one of thee personalized baseball Christmas tree ornaments. How fantastic to have YOUR PHOTO surrounded by a faux vintage baseball with your player’s name and year or his jersey number typed into text box templates. Instructions in the “Read More” section of the product description. Not all ornament shapes will work with every baseball Christmas ornament. Everyone loves the T shirt shaped ornaments. Looks like a baseball jersey ornament with a rustic old baseball on it. Any text you wish or delete the text. The perfect memory that they will love and cherish for a life time, their very own Personalized Baseball Christmas Ornaments. She will love and cherish one of these really nice Baseball Christmas ornament for girls and women who are avid baseball fans. She will love the pink baseball stitches and her name or your text. Pretty pewter snowflake baseball ornaments make lovely Christmas gifts too. If you have been asking yourself, what should I get my boyfriend for Christmas? Dirty old baseball gifts for guys will fit everyone’s budget. 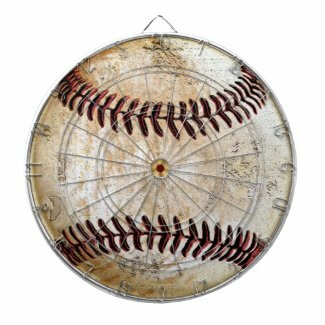 Cheap baseball gifts under $5.00 to moderately priced vintage baseball gift ideas. Personalized Baseball Keychains, Mug, Baseball Watches and so much more. Click the Image below to see all of our vintage baseball gifts for boyfriend for Christmas or any special occasion. This will take care of the question, what Christmas gift do you get your boyfriend who loves sports, particularly vintage baseball gifts. Coaches, Fans, Baseball Team Gift Ideas and Baseball Players. From Cheap Baseball Gifts for Teams to Mugs to Watches and More. Have you ever wondered what to buy baseball fans and men who love baseball? Makes a great Baseball Christmas Gifts for your special sports fan. When you are looking for gifts for sports fans, I think it is easy to find really cool custom sports gifts. There are so many options of what to get baseball fans for Christmas, Birthdays and Team and Coach Gift ideas. Thank you for stopping by YourSportsGifts.com. We hope you enjoyed our personalized baseball gifts for kids and guys. Contact us if you would like a gift customized or any changes or you just need some help. Call Rod or Linda if you would like us to create a vintage baseball gift or other custom order. We can make changes for you or put any design on any gift. Thank you for stopping by our Baseball Christmas Ornaments page. Makes a great baseball team gift ideas for players to keep for a life time. 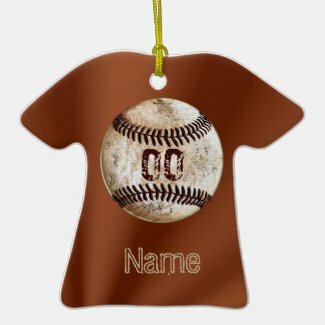 They will love one of these really cool Personalized Baseball Christmas Ornaments. 239-949-9090 BEST way to Contact us.